COUNTY PRESS RELEASE – With no end in sight to the cold snap, Rockland County Executive Ed Day reminds residents that the County’s new Warming Center is open and accepting occupants. The County opened the Warming Center in November in partnership with the nonprofit organization Helping Hands. It marks the first time that Rockland County has offered an overnight facility for single men and women who lack permanent housing or who have been displaced from their housing. 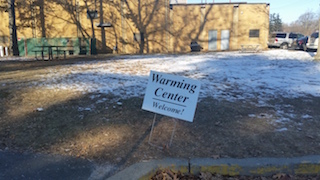 Approximately 50 people have been using the warming center every night since the frigid cold began. The Warming Center offers a safe place to stay, hot food, shower and laundry facilities. It also gives people the opportunity to meet with staff from the Department of Social Services to find out if they qualify for housing or other assistance, including help finding employment. Rockland County Department of Health staff members are also available to provide flu shots and other services. The Warming Center is located at a secure facility with onsite security at the Dr. Robert L. Yeager Health Center in Pomona. Buses are provided by Helping Hands from locations in Nyack, Spring Valley and Haverstraw. • Nyack: South Broadway in front of the First Reformed Church. • Haverstraw: Commuter parking lot across from Village Hall. • Spring Valley: Parking lot near Route 45 and Route 59. The County continues to run its long-established shelter for homeless families. The Warming Center will remain open during the day when the temperature is 32 degrees or colder. On warmer days, guests are transported to an outreach center run by Helping Hands in Spring Valley or other locations. For more information about the Warming Center, contact 845-356-0100 or 845-709-2415.